Since my sticky post disappeared somewhere deep in the archive when I imported my LJ, I figured I might as well make a new one. This is mostly a fandom journal. I draw a bit of fanart and I read and flail. My main fandom is Harry Potter, and I more often than not do slash. Usually of the Drarry variety. All fandom-related stuff, including all my fanart will be unlocked. All personal stuff is flocked. I love new friends, so if you think we have something in common feel free to add me. I promise I'm not scary :) Although if your journal is mostly empty or I don't know you I won't automatically add you back. So if we've never interacted at all before it would be nice of you to drop me a little message or a comment here as well. I'm on Tumblr, where I also have a 1d sideblog. Come and say hi to me there, if we're not following each other already! If you're creating something for me, here's a post about my likes and dislikes. Ps, you're awesome. Also, I'm hopeless and haven't got an updated masterlist. If you want to browse my art it's better to just check out my art tag. I'm more than okay with all transformative work of my art, but please let me know so I can be appropriately excited about whatever you've made! Please don't repost my art or edits of it anywhere without my express permission. So I fulfilled the challenge and made a likes/dislikes post. So if you're writing anything for me, here's what I enjoy the most. You are awesome, btw! Just popping in to post my art from kinkfest! It's a bit of an angsty thingy where Ginny has a very desperate and unrequited crush. NSFW! The prompt was about angsty masturbation. Summary: Ginny has a desperate crush, but she knows it can never happen. Notes: writcraft, thanks for the wonderful prompt. This started out a bit simpler, but it felt a bit too in your face. So I took your "go as angsty as you like" at face value and added a ton of angst. Hope you like it! My assigned giftee was pygmy-puffy. While I'm always a bit terrified to draw for other artists, they had a lovely and inspirational sign-up. And their wish for "soft pastels" made me want to try something new. So I made lineart and found some beautiful water colour brushes for photoshop online and some lovely soft colour palettes. This multi-panel thing is what I came up with. Summary: It's been years and Draco knows that he ought to let it go, but he can't help wondering what might've been. Artist's Notes: Dear pygmy_puffy, thank you for your lovely signup. It was such great inspiration for me, and it made me try out a style I haven't before which was a lot of fun. I saw you wanted atmospheric scenes, pastel colours, fluffy, flat faced animals and glimpses of everyday life and your prompts mentioned cottages and rural life. So I mixed it all together, and this is what came out (I'm sorry I went for a dog rather than a cat, but I know such a dog and she's adorable so I couldn't help myself). I hope you'll like it <3 Also huge thanks to Tami for volunteering to look it over for me. You were a great support and inspired me to add a panel. Lastly, thanks heaps to old and new mods for running such an excellent fest! Summary: Tired of the relentless media attention in the UK, Draco and Harry finally find some peace and quiet in the American wilderness. Artist's Notes: Dear thistle-verse, I sneakily spied on your fandom social media in the hopes of coming up with something that would appeal to you. I hope what I ended up with might be to your liking <3 Thanks so much to gracerene Grace for lovely support and feedback, and to the mods, brilliant as always. The title is from "Conrad" by Ben Howard. Thanks for all the lovely comments! I'll get back to them as soon as I can. Summary: There's this point in a relationship where everything is just... comfortable. A quiet morning is suddenly so much more. Artist's Notes: Dear anokaba, thank you for your lovely signup. Your prompts for domesticity, shoulder kiss and dressing inspired me. I hope you like what I did with it. Thank you, as always, to my dear beta who gave me the encouragement and inspiration that I needed! So I finally managed to finish what I started for this one :) A little moment between Parvati and Lavender after the war. Art under the cut, or on Tumblr. Please consider joining this fest! We need more femmeslash! Like, the obvious one is of course Harry Potter, because, obviously. I'm sure I've used that before though? But I don't know what else I should choose, so maybe I'll just talk about it some more. I think I haven't talked about this part before: English. I read the first three books in one go when they'd all been translated into Norwegian (I think it might have been around the time the translation of Prisoner of Azkaban came out), and then had to wait for absolute aaages for Goblet of Fire (like half a year, but when you're 11 that's ages). And not only that - I had to wait further half a year for the Norwegian translation of it, which was torture. I remember I actually tried to read my half-sister's copy of the English version, but I was only 12 at the time, and with such a big book the challenge was a bit too much. But THEN when Order of the Phoenix came out, it was the summer when I was 14 and then I was determined - I would read it in English when it was released. And so I worked my way diligently through it, through Rowling's penchant for using weird words (I particularly remember 'protuberant') and I succeeded! I reread it in Norwegain when the translation came out, but it was the last book I did that with. And so it opened a completely new world for me. If I could read an 800 page book in English, I could read anything! I've loved reading in English ever since, and I love the richness of the language. Maybe that's why I ended up studying English now? I'll set myself a fannish goal for this one - to be more active. To hang around more here, at least a couple of times a week, to draw more and.. stuff? I'll try to participate in a handful of fests (I think maaaybe Big Bang? If I can convince myself that some writer would like to have their fic illustrated by me XD). I won't be too ambitious, and rather pleasantly surprise myself than fail. Idk, I just really love this part. It's such a dark book in so many ways, with all of Harry's issues - everything he's going through, so this just felt like a little island of light and happiness and it made me smile. This one of Harry I made at the end of last year. I just really like how it turned out. 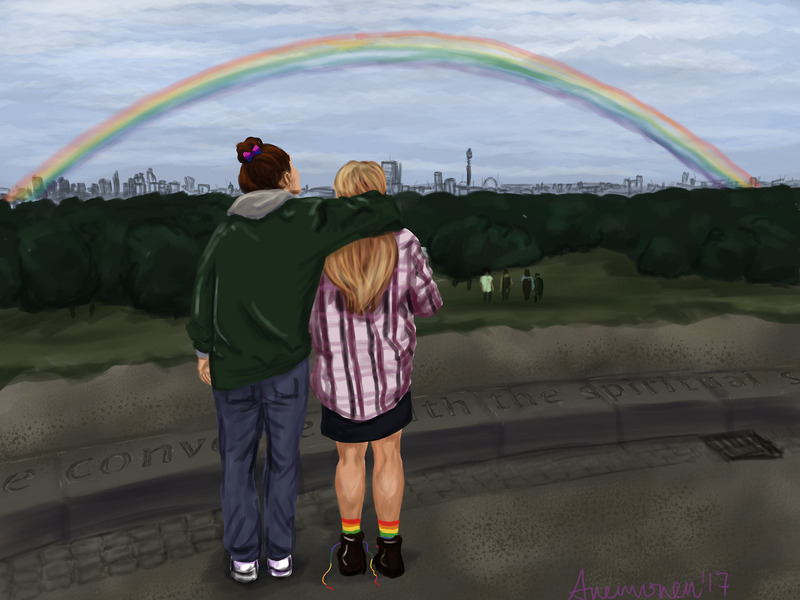 This Ginny/Luna piece I made last summer, because Linny, also pride and London and I like the mood of it. Oh, there are many things I really love, but maybe one of the things that resonates emotionally with me the most is a character's realisation/struggle/acceptance with their sexuality, their discovery of what that means and how good it feels to find out who they are, and coming out scenarios. When those are done in good ways, there's hardly anything that tugs on my heartstrings as much as that, and I really love when authors explore that. Especially subverting or challenging norms and figuring out who they are on their own terms. Oh gosh this is an awkward one isn't it.... Well, here goes. Oh gosh, what would I like? - Some plotty and deep diving femmeslash!! Preferably Ginny/Luna or Parvati/Lavender, but everything goes. - Recs for something good that you'd think I'd like? Something edgy and subversive maybe? Or political? This awesome and chill 90s Ginny by brokenphalange. And this absolutely heartbreaking picture of little Harry in the cupboard under the stairs by rijsamurai. Summary: Of course Al wanted him back. His nervousness from just moments earlier suddenly seemed impossibly silly. Artist's Notes: Dear prompter, this might not have been quite what you had in mind, but I hope you still like it! I really like this pairing, so I couldn't resist getting to draw them kissing a little. Title is from the song by HAIM. Anyways. Here's the Tumblr link and the pic itself is below the cut right here. It's very much safe for work. I did this little detail of Harry a little while back, and figured I should post it here as well. Art: Belated happy birthday, dicta!! I actually did post this on Tumblr a few days ago, but haven't have opportunity to make a proper post here until now. So here it goes! “We do.” Draco lifted his apple towards his mouth, but opened his eyes before he took a bite. His Roundway sat in his hands, as mottled and soft as it had been when he picked it up. - For future posting on dw, does anyone know if there's a way to host pictures directly on DW, that I haven't been able to find? ETA: If I open pictures from a dw post, I get a link like this: https://p.dreamwidth.org/a3d73d147767/2711932-105165/ic.pics.livejournal.com/anemonen/67514132/113575/113575_900.jpg -- so it includes the original lj address, but it IS a dreamwidth address.... What does it meaaaan. I'm not very computer savvy. Current Music: Arctic Monkeys - "No.1 Party Anthem"
Also figured it was about time I claimed it here as well. It's a James/Sirius piece, based on a prompt by shiftylinguini, and I had a lot of fun with it! Thanks so much to everyone who's left me such amazing comments on it! Sorry I'm taking a bit of time answering. Hopefully I'll get around to it vv soon. The gleam in Scorpius’ eyes was unmistakable. Or, the Potter/Weasley clan is big and loud, not to mention nosy. Finding some privacy is not easy when you’re spending the holidays at the Burrow. You’ll have to make do with what you can find. Art: Happy birthday to my loveliest Capitu! !